I wrote yesterday about some of the travel adventures I experienced over the years with my dad. What I didn’t mention was that he’s also a very talented website builder. I had a professional site built by a friend many years ago and while nice, it was hopelessly out of date. So I pulled together a bunch of ideas and went to my dad to see what he could do. 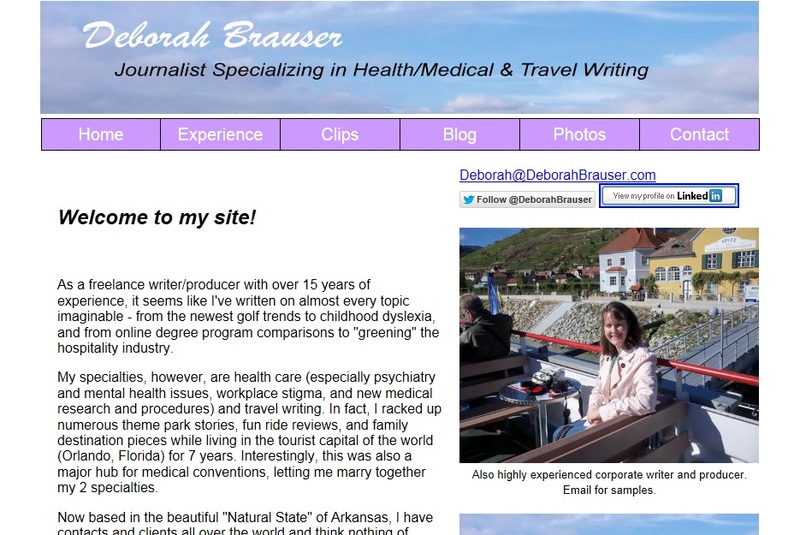 Together, we decided a site that was clean, easy to read and navigate, and full of my “Deborah personality” would be best so that potential editors and clients could get a better sense of who I am while looking at my portfolio of health and travel clips. What he created is better than anything I could have ever imagined and I’m so happy to now show it off to anyone and everyone I meet. The website url is super simple too: www.DeborahBrauser.com Won’t you take a moment and look around?